The Ashes of Defeat. 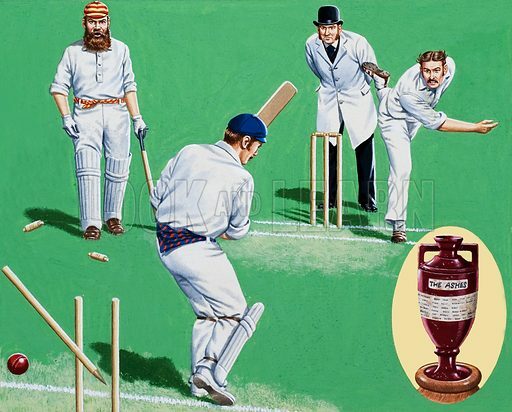 England's opening batsman looks on as his partner's wicket is shattered by the Australian fast bowler Fred Spofforth. Inset: the original urn containing the ashes of a burnt stump. Original artwork for the illustrations on p2 of L&L issue no. 919 (1 September 1979). Available worldwide for immediate download up to 4,457 x 3,590 pixels.